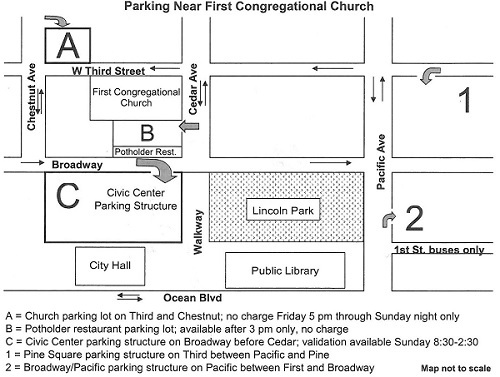 Civic Center parking structure at Broadway and Cedar: pull a paper voucher and have your voucher validated in the narthex during worship times. This voucher covers the whole morning, from 8:30 a.m. to 2:30 p.m. This structure holds more than 600 cars … you can definitely find a spot! Chestnut parking lot on the northeast corner of Third and Chestnut: free parking for church attendees. Street parking on Sundays is FREE. Parking meters on the street do not require payment on Sundays. Double check spaces with painted curbs; some of these have various limitations even on Sundays. If you have a legal handicapped/blue placard, all spaces are free and unlimited, 24-7. Mobility-limited parking: there are five spaces reserved on Sunday mornings in the Potholder lot (on Cedar Ave just south of the church) for those with or without blue placards who have mobility impairments. Please do not park here if you are able to walk unaided. Chestnut Lot: All members and friends may request a parking pass from the church office and park at the Chestnut lot. Please be mindful of spots marked reserved on weekdays, 7 am – 6 pm. Street parking is free after 6 p.m. Before 6, metered parking is for two hours. Potholder lot: you may park here after business hours in any spot (Monday-Friday after 2 pm, Saturday-Sunday after 4 pm). During business hours, those spots belong to the Potholder.